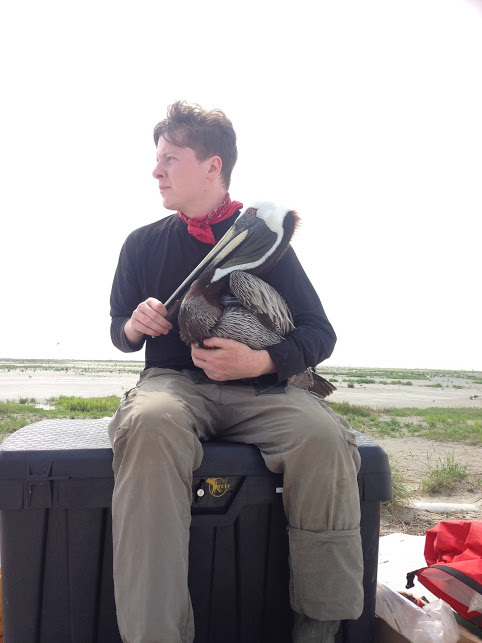 I am currently a postdoctoral researcher in the lab of Dr. Paul Leberg at the University of Louisiana at Lafayette, where I am investigating relationships between seabird behavior, unstable resource landscapes, and coastal restoration strategies. My research interests generally involve the integration of long-term, high-resolution data sets to gain a more comprehensive understanding of animal behavior at the individual and population scales. Specifically, my dissertation work focused on the movement and foraging ecology of brown pelicans (Pelecanus occidentalis), using biologging and remote sensing technologies to determine how within-individual variability defines foraging strategies, and the degree to which breeding populations can modify foraging distributions in response to increased energetic demand. Our ongoing work seeks to identify terrestrial conditions that impact recruitment and productivity of seabird colonies on Gulf barrier islands, characterize important linkages between breeding and foraging grounds throughout the Gulf coast, and identify environmental cues that shape pelican foraging strategies in real time. I previously received my B.SC. in Resource Biology and Biodiversity from the University of Louisiana at Lafayette in 2009, and a M.SC. in Population and Conservation Biology from Texas State University – San Marcos in 2012. My thesis work with reddish egrets (Egretta rufescens) contributed to four publications that have since been referenced in several of the species’ conservation plans. My PhD was completed in 2018, and has thus far yielded two publications and another currently in review. For more information on these projects, see my Research page.